HomeAll PostsAge & Gender IssuesWHY DO NECKS AGE? Our necks do not have fatty tissue, the skin there is drier, more delicate and less elastic, thus making it more lined, saggy and ‘crepy’. Like the face, the neck is at high risk of UV damage because it has fewer melanocytes cells – the ones that make the pigment that protects our skin from sun damage. This makes it look mottled and uneven in colour when damaged by UV rays. 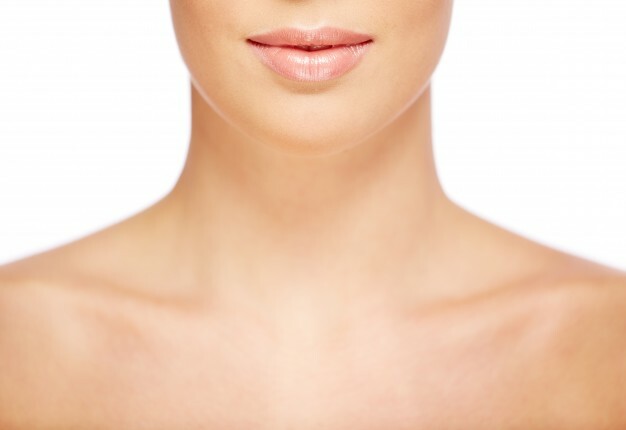 Furthermore, the skin on both our neck and our décolletage is thinner than the skin on our faces, so it’s very fragile. As we age, we lose moisture and collagen. All of this together is a perfect cocktail for an old neck. Neck needs to be cleansed and toned twice a day, like your face, and then massaged in upward motions. Alpha hydroxy acid-based creams and washes (Glycolic acid) help the lightening agents get deeper into your skin for improved results. It is mandatory to use a sunscreen with an SPF 30, every day. In addition, a product containing Vitamin E and olive oil will nourish dried out skin, while vitamin C will help to fade discolouration. At night, a retinol based cream, hyaluronic acid cream, and a vitamin B cream is your magic potion. At Beautyworks we have just the perfect cocktail for your neck in the form of SkinVital. 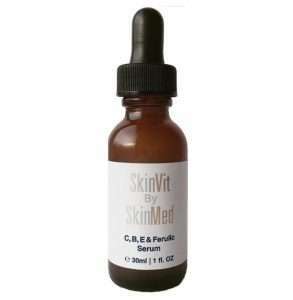 SkinVital® By SkinMed is a non-animal tested, highly concentrated serum, which utilises patented technology to deliver key skin boosting ingredients deep into the skin and works both in the water and oil parts of skin cells for a more complete action of skin cell health. The 30 ml bottle, with an application pipette contains 20% Vitamin C, 1% of Vitamin E and Vitamin B3 and B5 different B vitamins, Ferulic Acid and also Hyaluronic acid for surface hydration. We also have a range of high-end sunscreens from Alumier, Obagi and Heliocare along with Heliocare capsules to give your skin internal protection. Keeping your neck straight and long to prevent horizontal lines, sleep on your back, neck extended on a pillow and don’t bend over your phone all the time. Exercise the muscles in your neck.Make them strong! You need them to hold your head up! WHAT CAN I DO IF MY NECK IS DAMAGED? 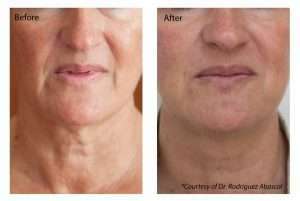 If you do have an aged neck, we can offer you a complete neck package with anti-wrinkle injections for turkey bands, skin resurfacing for crepey skin, Profhilo for a neck lift, radiofrequency for skin tightening and fillers for those annoying lines. All you need to do is come in for a no obligation consultation to see what your options are.